The thyroid is a butterfly-shaped endocrine gland located in the lower front of the neck. The thyroid's job is to make thyroid hormone which is essential to help each cell in each tissue and organ to work right. For example, it helps the body use energy, stay warm, and keep the brain, heart, muscles, and other organs working as they should. Think of the thyroid like a car engine: a healthy thyroid hums along with a steady, even purr. You don't think about it too much; it just works. But a glitch in thyroid function can cause multiple changes in the way the body functions, just as a misfiring engine can hinder-or disable completely-the driving performance of a car. Hypothyroidism or underactive thyroid refers to a condition in which the thyroid gland is not producing enough thyroid hormones. Since these hormones control many bodily functions such as your metabolism and how your cells use energy, an underactive thyroid can become very symptomatic. When the thyroid is in a hypoactive state (hypothyroidism), it functions at a reduced speed and becomes sluggish, which can slow the body's metabolic functions. This loss of function can produce symptoms such as weakness and lethargy, fatigue, unexplained weight gain and sensitivity to cold. The concept behind the use of T4 hormone replacement alone is that synthetic T4 will be converted into T3. A major flaw with this concept is that the conversion from T4 to T3 may not happen, or may only happen at a diminished rate. Therefore, a hypothyroid person would not receive benefits from T4 hormone replacement alone as they may still be deficient in T3. 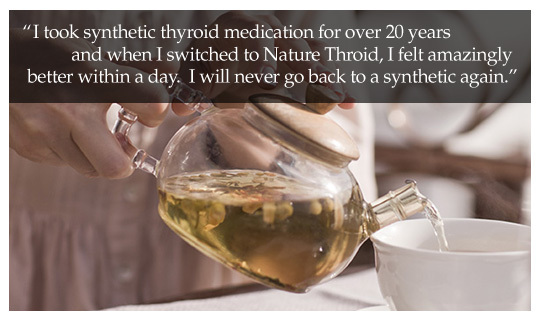 In reality, many patients do not start to feel relief from their symptoms until they switch from synthetic to Nature-Throid. Dr. Hohenwarter carries Nature Throid. Nature Throid adheres to strict United States Pharmacopeia (USP) monographs for potency and consistency. Nature-Throid has guaranteed T4 and T3 hormone levels. Every batch is tested to ensure it meets or exceeds these USP standards. Nature-Throid also complies with all FDA pharmaceutical guidelines for manufacturing and processing. Nature Throid is a prescription only product. Learn How to become a Patient today. Our thyroid patients come to our disease prevention doctor from Reading, Harrisburg, Hershey, Lancaster, Chambersburg, Elizabethtown, Hummelstown, York and Palmyra, PA.